The Men in Black are real. That's the viral Sony seems to be running for the upcoming Men in Black 3, which just got a sci-fi time-travel filled new trailer this morning, as it will be hitting theaters in just under three months. We first found this MIB viral site, located at TheMenInBlackSuitsAreReal.com, late last year around when the first teaser trailer debuted, but now with another trailer, more viral marketing has started up. ComingSoon noticed a huge subway ad for the viral in New York today, touting an 800-number to call to leave a message about your "alien encounter." All this links to the blog being run by "Bugeyes126". 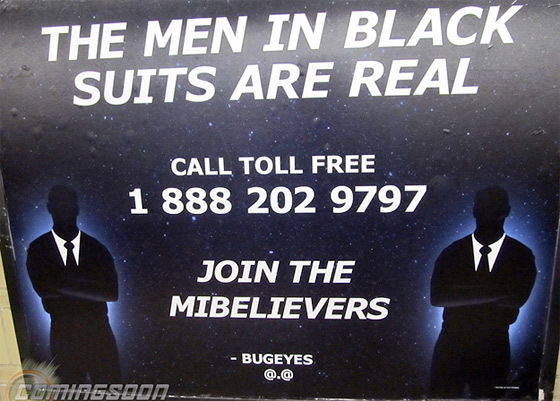 The subway ad on ComingSoon, the only piece of new MIB viral advertising we've seen so far, states "Join the MIBelievers" which is a purposeful misspelling with MIB. It's also signed "Bugeyes" with @. @ which is a great ASCII icon. But where does all of this lead? For now, just to the Men In Black Suits Are Real site, which in January was updated into a full-on blog being run by "Bugeyes126", a fairly young 14-year-old kid who is "interested in extraterrestrials and have been following groups of Men In Black Suits who seem to be involved in covering up alien activities." He also posted a new welcome video today talking about the MIB and how they're "hiding aliens in plain sight", of course. So he's "destined to prove this organization exists." Beyond that, this seems to be a wait-and-see and follow-along kind of viral, where we watch as Bugeyes126 keeps posting updates to his blog and potentially unlocks some major clue that will link him to the movie. Additionally, if you call the number 1 888 202 9797 it's a message recorded by Bugeyes providing info on what he knows, including to look out for some guy named "Clive". There's actually more info here than there is on the website, it's a good start. It also asks people to leave their own message with "any information on extraterrestrial sightings", and it may eventually be used in the viral or it will probably show up on his blog. That's all we've got for now on The Men In Black Suits Are Real, otherwise this seems much more laidback than the viral for The Amazing Spider-Man or even the Weyland Corp. viral for Prometheus. But we'll be keeping watch anyway, as that new trailer may put Men in Black 3 on everyone's radar this summer. Keep following his blog, trying calling the number, and we'll let you know if we find anything related to the MIB. Update! Another new viral website has been discovered as part of this The Men In Black Suits Are Real experience. 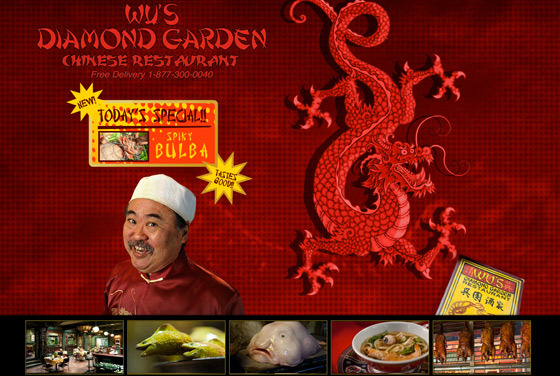 ComingSoon found a page for Wu's Diamond Garden Chinese Restaurant. This looks to be the same Chinese restaurant they go to in the beginning of the latest trailer, with the goldfish incident and that giant tank of green water (not screen). The site features an entirely disgusting menu, some cheesy Chinese music, and a weird Flash game. It's not the most appealing, but it is another part of this MIB3 viral, though I'm not exactly sure how they came across it. To visit, check out WusDiamondGarden.com and start clicking.